Random House Books for Young Readers, 9780525578864, 144pp. Dink, Josh, and Ruth Rose get to the bottom of the Grand Canyon--and a mystery--in the eleventh A to Z Mysteries Super Edition! 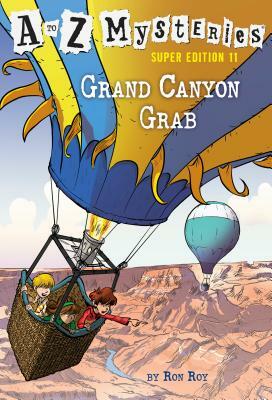 Dink, Josh, and Ruth Rose are visiting the Grand Canyon when they spot Parker Stone--a famous TV star. They can't wait to get his autograph, but before they can, Parker is kidnapped! Only a few clues--and his pet parrot--are left behind. It's up to Dink, Josh, and Ruth Rose to find Parker--before it's too late! Help Dink, Josh, and Ruth Rose solve mysteries from A to Z! From The Absent Author to The Zombie Zone, there's a mystery for every letter of the alphabet, plus super editions with even more A to Z fun. And don't miss Ron Roy's series for younger readers, Calendar Mysteries! RON ROY has been writing books for children since 1974. He is the author of dozens of books, including the popular A to Z Mysteries and Capital Mysteries series. When not working on a new book, Ron likes to teach tricks to his dog, Pal, play poker with friends, travel, and read thrilling mystery books. Visit Ron online at RonRoy.com. JOHN STEVEN GURNEY has illustrated many books for children, including the entire A to Z Mysteries series and Scholastic's popular Bailey School Kids series.